So The Birds wasn’t really a scary movie by the time I’d saw it. The zeitgeist had moved on and people expected their films to look more realistic (and more realistically colored). 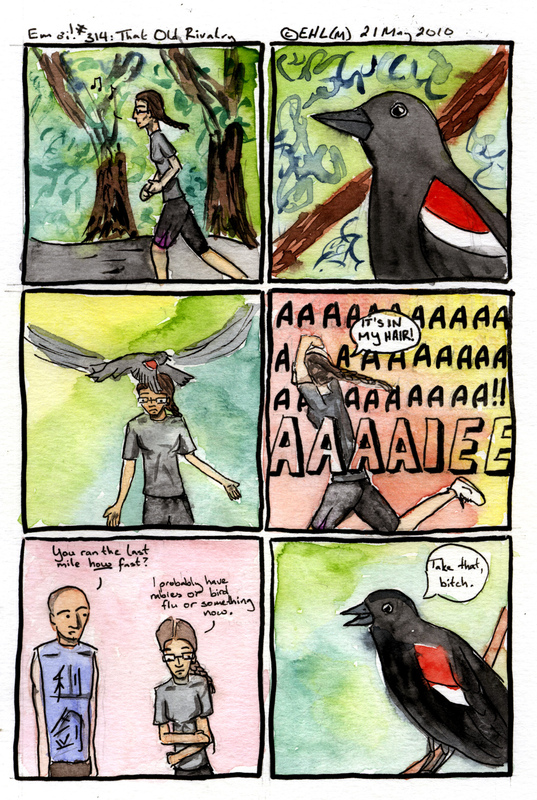 But having a red-winged blackbird come down on your head? That’s scary. Bryan: I would have paid money to hear that scream. Emily: If you’d been outside, you would’ve. RWBBs are about the size of robins and fairly aggressive between May and September (the nesting season). They usually don’t go after people in pairs, but they will attack a solo jogger. Bryan only runs with me, so he’s never been the victim of this sort of attack, and I think he thinks my enmity is a bit much. But then again, I have rather long, thick hair and he doesn’t. If a bird lands on his head, it will hurt, but there are no chances of…entanglements. QL795.B57 L86 2010, for Zoology–Animal behavior–Stories and anecdotes–Special. By common name of animal, A-Z–Birds.